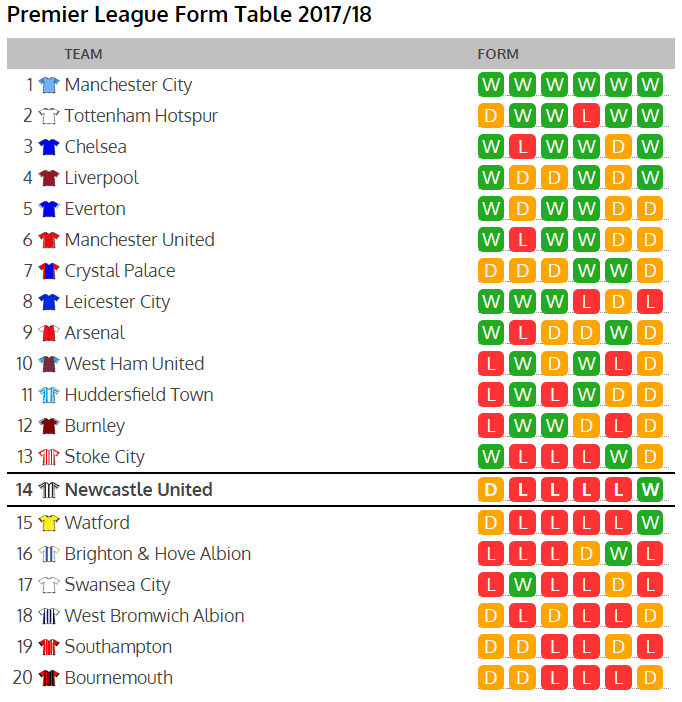 The Premier League form table tells its own story for both Newcastle United and Manchester City. Not only are Manchester City top of the form table based on the last six games, if you stretched it back you would see 17 x W.
Actually, whilst Newcastle had their early season wobble when losing the first two games, Man City also had theirs, dropping the only points they have so far, drawing 1-1 at home to Everton when Kyle Walker was sent off. An incredible 51 points from 51 for Manchester City since that early hiccup, whilst Newcastle have picked up 18 points from the last 51. So is there hope for Newcastle tonight? The last four matches have seen Man City knock four past Bournemouth, Spurs and Swansea, whilst the game before that trio of fixtures saw them go to Old Trafford and completely dominate their closest rivals, winning 2-1 but it should have been more. However, the first two games of this Premier League form table over the last half dozen matches does give some indication that Man City are not flawless. Newcastle have looked the better team against both West Ham and Southampton and they came close to taking a point in recent weeks off the champions-elect. Southampton looked to have got a draw at the Etihad only for Man City to score in the 96th minute to win 2-1, then West Ham led at the same venue, only for second half goals to give the home side another 2-1 victory, the winner coming with seven minutes remaining. Keep it tight and hopefully take one or two chances that come their way, Newcastle will be hoping. Looking beyond tonight though, the next three opponents are in 16th, 13th and 17th positions respectively in this form table and points must be taken against Brighton, Stoke and Swansea. Probably the highest odds ever (14/1) for Newcastle to win at home, tells you everything about what neutrals and bookies think, but those odds suggest that one in every 15 times Newcastle would beat Manchester City and with a draw at 11/2, Newcastle would be fancied to pick up a point every six or so home matches against Man City. Difficult but not impossible tonight.